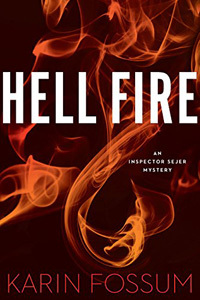 Hell Fire by Karin Fossum: Synopsis and Online Purchase Options. Synopsis (from the publisher): A gruesome tableau awaits Inspector Konrad Sejer in the oppressive summer heat: a woman and a young boy lay dead in a pool of blood near a dank camper. The details of the deaths of Bonnie Hayden and her five-year-old son Simon are mysterious. There is no sign of robbery or assault. Who would brutally stab a defenseless woman and her child? Sejer and his fellow investigator Jakob Skarre begin a hunt for the killer that will eventually lead them to a heartbreaking conclusion.